Irene Weiss was born Iren Fogel on November 21, 1930, in Bótrágy, Czechoslovakia (now Batrad’, Ukraine) to Meyer and Leah Fogel. Upon arrival at Auschwitz-Birkenau, her mother, three younger siblings, and older brother were killed. Along with the 100 or so other Jews in our town, we were taken to an abandoned brick factory in the city of Munkacs, some miles away. There we joined hundreds of Jewish families from neighboring towns. There was a bucket for the toilet in the middle of the car. Hours passed, a night and a day. The bucket filled. Peering out the slit, my father confirmed our worst fear: the train was crossing into Poland. 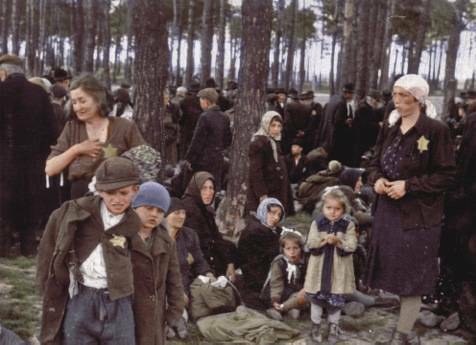 We had heard rumors of mass shootings of Jewish families in the forests of Nazi occupied Poland. We had never heard of Auschwitz. Finally the train stopped. “We are at some kind of camp,” my father said. “There are barracks and prisoners in uniform. This must be a work camp.” We were relieved. The rumors had been wrong: we were not going to be shot in the forests of Poland. When the doors of the train opened, we heard shouting, “Out! Out! Fast! Leave everything behind!” Hearing that, my mother pulled out extra clothing and told us to put on more layers. My head was already covered with a kerchief, and I put on an over-sized winter coat. We were awakened before dawn every morning for inspection or “Zähl Appell”. We were made to line up in the morning cold, five in a row, standing for hours to be counted. This was also another opportunity for the SS to pull out children they missed at the selection ramp, and those who looked sick. This was a very dangerous time for me because I was only 13 and small. I tried to stand on a rock, so that I would seem a little taller, and pinched my cheeks, so that I would look healthier. In a few weeks, numbers were tattooed on our arms. 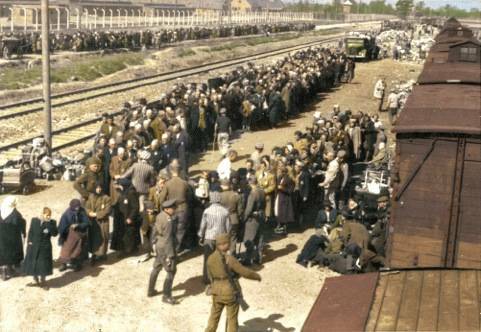 Soon after that, we were sent to work near crematoria # 4 at a storage and processing area that the prisoners called, “Kanada.” There we sorted through mountains of clothing, shoes, bedding, eyeglasses, toothbrushes, baby carriages, suitcases, books, pots and pans, and every other household item. We were ordered to hand over any valuables that were found among the belongings. I am overwhelmed to be present in this courtroom at this moment of historical reckoning. I am here to honour the memory of dozens of members of my family, who perished in Auschwitz. I never imagined that I would travel to Germany. From childhood, I have been familiar with the sound of German place names. Gelsenkirchen, Sömmerda, Glachau, Buchenwald, Flossenburg, Bergen Belsen – these names punctuated stories my parents and their friends told about the war. They were stories of almost unimaginable horror. I want to thank the court and the German people for the opportunity you are giving me to speak to you about the loss of the many members of my family whom I never knew, because I was born into loss. Unlike most of the other co-plaintiffs, I am not a survivor, but the child of two survivors. I was born after the war in Hungary, to parents who met after the war, and who had each been married to other people before the war. My father Guszav or Guszti Weinberger had been married to a woman called Margit , or Mancika, Mandula, and they had a little girl together called Eva Edith, or Évike, Weinberger. I am here to speak primarily about Évike, who would have been my older half sister had she not perished along with her mother in Auschwitz on June 3, 1944. How, you might ask, can I speak authentically about someone whom I never knew? It’s a good question. Évike somehow is both my sister and not my sister. She is my sister because she was my father’s daughter, but I clearly could not have a relationship with her of the kind that you have with a sibling with whom you grow up. And yet, Évike has been a singular presence in my life from the time that I came into the world in November 1947 to this day, here in Lueneburg charged with telling you about her short life. I was about six years old when I first really understood who Évike was, and she was six years old when she was murdered. Over the years, I have become older, but she has stayed six years old. So even though today she would be seventy-seven, in my mind now, she is a child like my grandchildren, not like an older sister at all. I feel a great sense of responsibility towards her, a little girl like so many other children who perished – but also a little girl like nobody else in the world, a unique individual, a unique person. Évike was born in the city of Debrecen on April 19, 1938, a much desired, much loved only child to Guszti, and Mancika. They were prosperous, hard-working, modern Orthodox, educated Jews who were completely integrated into Hungarian life. Guszti and his two brothers were third-generation farmers on an estate in northeastern Hungary, in a village called Vaja . Mancika was an accomplished, well educated young woman who had attended a finishing school in Switzerland. She was an adoring wife to my father and a devoted mother to Évike. Évike’s childhood encompassed dark and menacing events in the world: anti-Jewish laws in Hungary, Kristallnacht in Germany and Austria, and the outbreak of war. Guszti was frequently away from home, serving in the special labour battalions into which Hungarian Jewish men were inducted, THE MUNKASZOLGALAT. Because of this, Évike and Mancika moved to the family estate in Vaja, where my father himself had grown up, and where there also lived my grandparents, and my uncle Pal, his wife, Mary, and their little girl, Marika. Despite the gravity of the situation, life remained relatively normal for them right up until a month before Évike’s sixth birthday: relatively normal until March 19, 1944. The two little girls, Évike and Marika, were playmates, and they were doted upon by our grandparents and by the other many members of the large extended family, who visited the estate regularly. There are many pictures of the two little girls playing together, and also many photographs showing them with members of the extended family, everybody wearing big smiles. I have known about Évike ever since I can remember. There were photographs of her on the walls of the apartment in which I grew up in Budapest, including many in the room in which I slept. There were albums, photo albums, of my father’s dead family, and of my mother’s dead family. I have memories of myself from a very young age leafing through the pages of their albums, and asking for the names of the people depicted in the photographs. I even remember my mother smiling and saying I had the same sticking out ears and same bow legs as Évike did, and that we had inherited both these features from our father. When, many years later, I began to research Journey to Vaja my book about my father’s family, I learned about the unusual way Guszti and Mancika brought up their little girl. When I interviewed my father’s cousins, they commented on the fact that instead of hiring a nanny and leaving the upbringing of Évike to the nanny and Mancika, my father had wanted to be fully involved in her care. Unlike stereotypical fathers of the 1930s and 40s, Guszti had bathed the baby, and rocked her and played with her, in a way that was unusual for the time. I recognized the portrait of my father that his cousins painted for me, because he had been the same kind of father to me and my sister, very protective and very involved. My father was a wonderful storyteller, who loved to talk about the family he had come from. Among my first memories is of him telling me stories about his family – and these were invariably happy stories. He evoked festive occasions on the estate and especially liked to talk about the adventures he and his brothers had growing up on a large farm. Still, even though these were positive stories, he would preface them with the words, “I feel sorry for you because you don’t know what it is to have grandparents. I feel sorry for you because your world starts only with me and with your mummy.” I didn’t understand at all what he was talking about. I didn’t want him to feel sorry for me. I didn’t feel I was missing anything. But of course he was right. I didn’t have any grandparents. My father’s parents and my mother’s parents had all perished in Auschwitz. And most of my aunts and uncles had also been murdered. As I matured, I came to know more about Évike. She had been a sweet natured, rather shy and reserved little girl. She had also been exceptionally intelligent, and though she was too young to have started school, she had actually taught herself to read and write using her storybooks and the daily newspaper. This is important to Évike’s story as I will try to explain later, because since she had learned to read and write, we can actually know a little bit about her from her very own words. My father was a member of a close and very loving family, who continued to support him and his two brothers while they were in slave labour service during the war MUNKASZOLGALAT. They sent him parcels with food and clothing, and many, many letters. In 1944 alone my father received more than 150 letters and postcards from his family. More than 150 letters. I know this because my father kept them all: he managed to keep them in his knapsack through his entire wartime ordeal. These letters came from his mother and his father and his wife, and yes from his little girl Évike. The little girl who had never gone to school. He kept them , not just during the war, but afterwards too. And, many years later when he saw that I was very serious about writing a book about the family – this was back in 1982 – my father told me he still had these letters. I began reading them with him. They were all in Hungarian, so I began to translate them all into English. And while I was doing this, I had a kind of breakdown. Working with the letters prostrated me, almost literally. I couldn’t function for months, because of their impact on me. Because these letters were from the people that my father had been telling me about from the time that I was very young. And when I read them, I saw how right he had been, because indeed, it was a very sad thing that I never knew my grandparents. And here they were, in these letters. I could touch the paper that had been in my grandmother’s hand and in my grandfather’s. I could see what good people they were, how courageous, how very hopeful and determined to find each other again after the cataclysm. They kept on sending my father messages of encouragement that I could read for myself. And I knew what they didn’t know, what they couldn’t know. I knew, I knew that history was going to eat them up. I knew that they were all headed for Auschwitz. There were three generations of the Weinberger family who were forced to leave their home for the ghetto in Kisvarda on April 25 1944. Évike had celebrated her sixth birthday six days earlier, on April 19. On April 19 her mother, Mancika, wrote to Guszti, that they were packing up their bags and that it was hard to know what to take along. She was particularly upset that she would have to give up her wedding ring, but she wrote, “you will buy me another one some day if God willing, we meet again once more. Today is the darling child’s birthday, we congratulated her in tears, and I wish that all her future birthdays, she will attain under happier circumstances, then today’s, until she’s 120 years old.” Until 120 years old, Évike’s mother wrote. That is the traditional Jewish greeting on someone’s birthday. Both Évike and Mancika would die 45 days later on June 3, 1944. Évike was a child cherished not just by her parents, but also the whole extended family and especially by our grandparents. I would like to speak about my grandparents. They were very religious people with a great deal of faith in God, but they were also educated people, who could express themselves beautifully in writing. My grandmother Ilona, after whom I’m named, wrote in her farewell letter to my father: “if you could see me, you would say I am a veritable hero and I owe this to the fact that, thank God, I am perfectly healthy and also to my unshakable faith to which I cling… We all have to fortify ourselves so we can bear it all. Don’t worry, I will do everything for the two sweet children [Évike and Marika], after all, they have always been the light of my life, along with all of you.” She promised she would do everything for her two little granddaughters, not realizing that she would be powerless to do anything to help herself or anyone else. My heart breaks every time I read these words, and think of the agony that my family went through at that time. The agony that my grandfather must have felt writing these words. It touches me profoundly that my grandfather even had a blessing for me and for my sister Judith, who testified here last week. Because we were the “yet to be born Children,” the children he would never know and who would never know him. Of course he could not imagine that the mother of these children— would not be Évike’s mother, my father’s first wife, Mancika. I want to say a few words about Évike’s mother, Mancika Mandula Weinberger. She was a devoted daughter to her parents, an adoring wife to my father, and a completely dedicated mother to Évike. She was patient and thoughtful. She knew many languages because she had attended a finishing school in Switzerland where she had mingled with girls from many different nationalities. She was thirty-five years old in 1944, and she was strong and fit, and had she not been the mother of a six-year-old, she would’ve had a chance to live. I don’t think she would’ve wanted to live without her child, but in stark terms, the child whose hand she was holding condemned her to death in Auschwitz. We all know what happened next. It was not my father who met them on the ramp in Auschwitz. I cannot bear to put words to what I know happened next. I have been asked to talk about the impact of the Holocaust on me, to talk about how it has damaged me. To try to answer that question places me on the horns of a dilemma. I have not come to Germany to elicit your pity. I don’t think of myself as a damaged person. I am a happy person and I have a full life. It would be ethically wrong to call myself a victim in a courtroom where you are hearing from survivors. 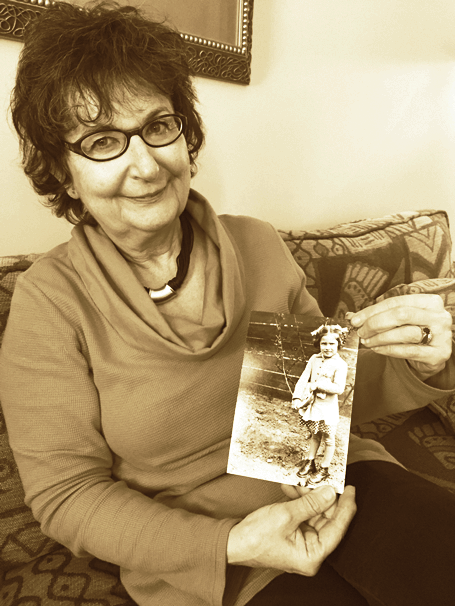 I am not a survivor of the Holocaust; I was born three years after the events we are describing. Any pain that I have suffered cannot be compared to their suffering. But if I’m going to be honest with myself and with you, I must face the fact that indeed the impact of the Holocaust on me has been foundational. The very circumstances of my birth are predicated on the death of others. If Évike and her mother had lived, I would not have been born as myself. If my mother and her first husband had not been separated, but if I had been born to them, I would also not have been born as myself. And yet I feel enormously fortunate to have been born, and to have been born to my parents. And I know I was a great source of happiness to them simply by token of my birth. When he learned that my mother was pregnant with me, my father said to her that he felt the kind of joy that God must’ve felt on the day of creation. And Despite their grief and the enormity of their losses, my parents went on to build a solid new life for themselves and their children in a new country. In the course of building this new life, they never forgot the family members from their former lives , nor what had happened to them. It was important to my parents to communicate to us a rich legacy of family memory. For the formative years of my life, the Jewish holidays meant sitting at a table for four, my father, my mother, my sister Judy and myself. The table would be festively set and there would be a nice meal, during which my father and my mother reminisced about what the holiday had been like in the days before the war. They talked of All the many people who had congregated around the large dining room table back home, and the copious amounts of delicious traditional food. It was as if the Holocaust were a visitor sharing our meal with us. Before my father died at the age of eighty-four, I had hardly ever attended a funeral. A friend of my parents came to pay a condolence visit during the week of mourning that we call Shiva. She had been a child survivor and had lost everybody in her family. When she came into the room where the mourners were sitting on low chairs as is the custom, with all the mirrors in the house covered as is the custom, this friend of my parents made a gesture with her hands to encompass the signs of mourning, and she said, “we don’t know how to do this. We’ve never done this before.” She didn’t have to explain what she meant, because We understood perfectly. Having lost virtually everybody, all at once, my parents’ generation – and by extension, us, their children – had never had a chance to express grief in a normal way, as one does when generations pass away in their natural order. We had never had experience with the normal rituals of mourning, because everybody was already dead. Nowadays, when my family gathers together to celebrate the Jewish holidays and in particularly Passover, a holiday celebrating freedom from slavery, there are once more three generations grouped around a very long table. There is a passage in the Passover Haggadah in which it says that in every generation a Jew must feel as if he had personally been liberated from slavery. In the era when my father led the family seders, he always paused at this passage to remark that this was not some remote thing that happened thousands of years ago. He said that in our times he and my mother had suffered from a slavery that was incomparably crueler than anything in the time of the pharaohs, and he told us to never forget to guard our freedom and the freedom of others with our last breath. I think this is what I have come to say to the court: that justice and freedom are our highest societal values. They must be regarded as precious as life itself. Having the opportunity to tell my family’s story here – having the opportunity to speak to you of Évike, Mancika, and my grandparents – is an affirmation that that their lives, so cruelly cut short, mattered. They were not statistics, they were flesh and blood, individuals with personalities, temperaments, frailties and strengths. There is no way to go back to undo the catastrophe that befell them. There is no way to fix what happened to them. But acknowledging the enormity of what happened to them in this courtroom and before the world is a source of a certain consolation.